How do I assign a program to a client? Once you have created a program you will want to assign it to your patient. From the program editing window (either daily or weekly), tap the "Choose client" icon to select or add your client. Search for an existing client in the search box, or add a new client by tapping the " +" symbol. 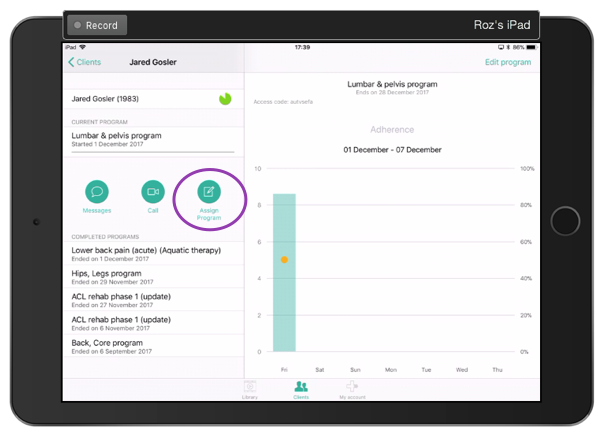 Select dates and duration for the program, chose to track pain and adherence, and attach outcome measures and educational content in this final assign window. Finally tap, " Assign" in the top right corner to generate your patients access code. If there is no email address or mobile number attached to your clients file, you will be prompted to enter this. Otherwise simply note down the access code for your patient to take home. This will be used to retrieve their program in PhysiApp. Note: You can also assign a program to a client from their file in Physitrack. 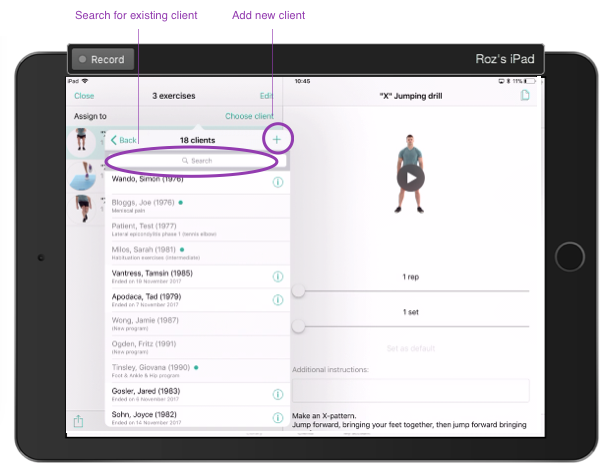 Simply find their file via the "Clients: menu, tap on their name to open it up, then tap "Assign Program". Thereafter follow the steps listed here. How do I copy a program to my library? How do I add and delete my own exercises to Physitrack? How do I create an exercise program? How do I find exercises in Physitrack? What is pain and adherence tracking?